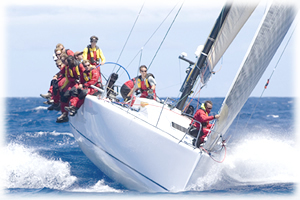 When you go yacht or dinghy racing you need the piece of mind to enable you to have fun and know that you can compete to your utmost without the worry of the costs of potential damage to your vessel. You are normally covered for racing under a yacht policy but your rig (Masts, Spars, Sails, Running and Standing Rigging) will not be covered whilst you are racing. Your rig can be covered whilst racing for an additional premium. Make sure you ask us for a quotation so that you can extend your policy to include this cover for piece of mind that will let you compete without worry. With the exception of dinghies (where racing cover is included for free) all we need to know to insure your rig whilst racing is the replacement cost for mast, sails, spars and rigging combined (you'll be asked for this separately to the combined cost of included in the vessel value). The additional premium will be based on the replacement cost and the type of races you intend to take part. You can be fully insured for racing literally within minutes like any other of our standard boat insurance policies, it is that simple! Alternatively, if you have more bespoke requirements, just contact us and provide details. You can enjoy your racing with total piece of mind!